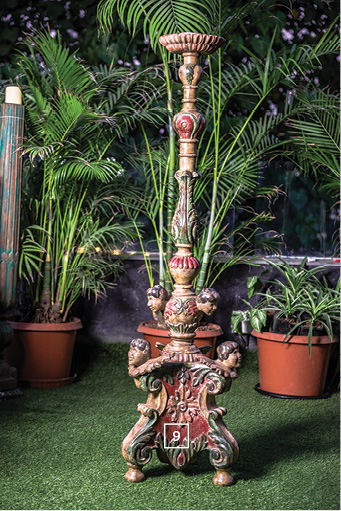 Traditional Indian artefacts sourced from different parts of the country sit snugly alongside old world Portuguese furniture and candle stands in this al fresco setting. Each handpicked beauty used in this set-up is dipped in history and revels in nostalgia. 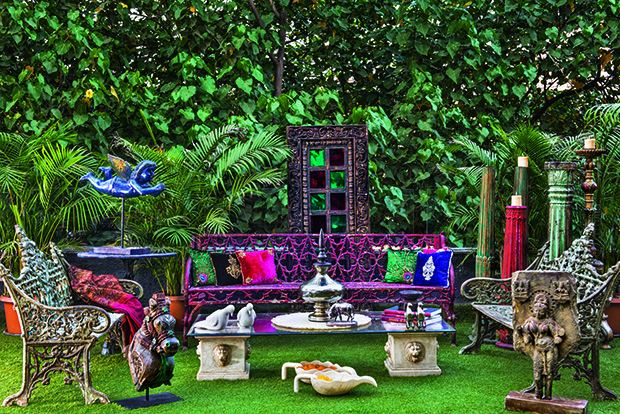 This lovely outdoor setting is created by the talented in-house designers of The Big Door in Mumbai. 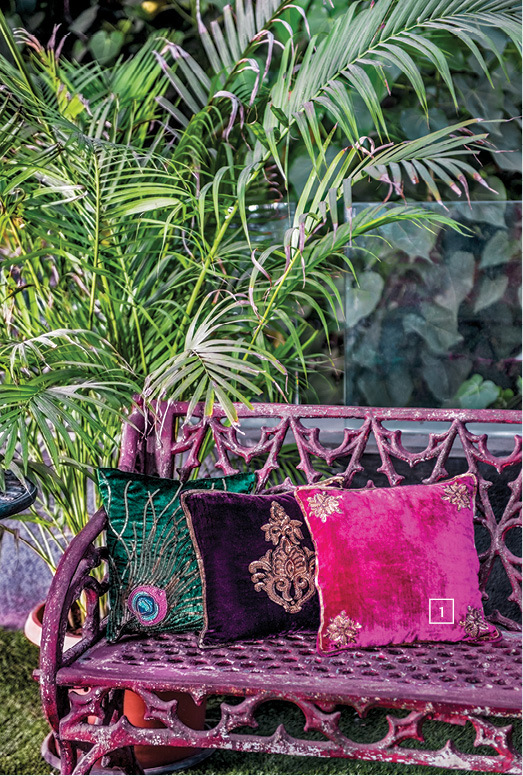 1 Bring home opulence with the regal collection of cushion covers made using Indian motifs and designs. These embroidered velvet cushions are available in rich fabrics and electric hues, in both small and medium sizes; ` 1,500 to ` 3,000 (each). 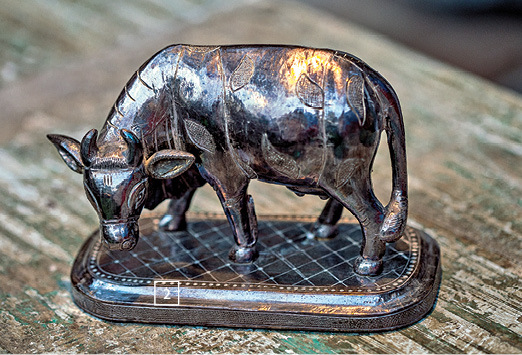 2 The Silver Cow Statue is a collectible and is created by cladding a 99.9 per cent pure silver sheet onto teakwood; ` 32,700. 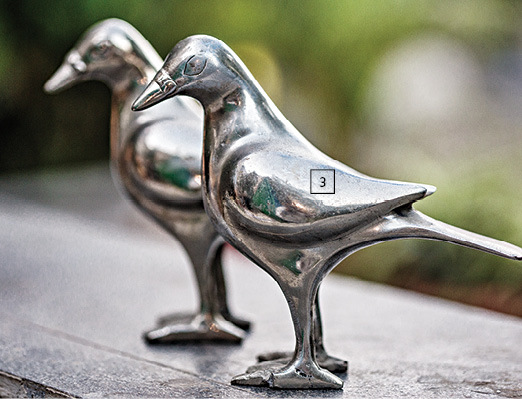 3 These handpicked White Metal Birds sourced from Udaipur will sit pretty in your garden or on the coffee table of your living room; ` 9,000 (each). 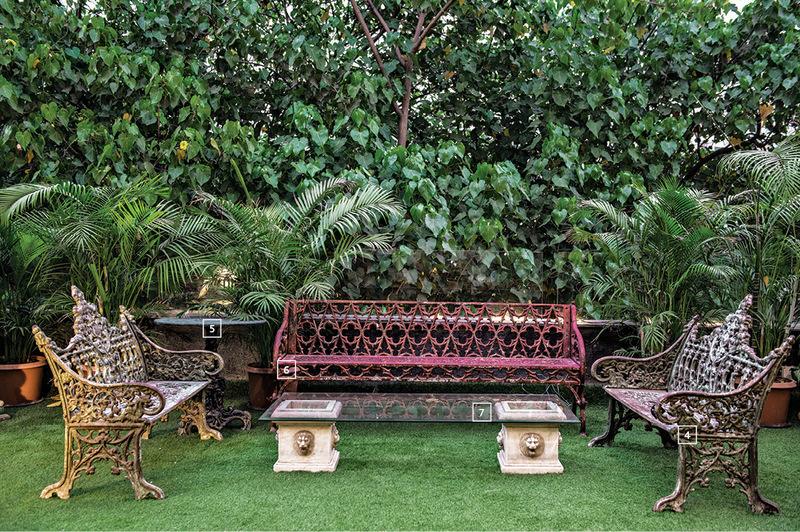 4 Bring the romance of the bygone era right into your garden with the vintage cast iron patio (green-hued) two seater benches sourced from Goa; ` 57,000 (each). 5 The round side table is a blue Portuguese cast iron coffee table that comes as a set with four chairs. Sourced from Goa, the table has intricate carvings of Victorian angels on the table and chairs; ` 2,47,500 (for the set). 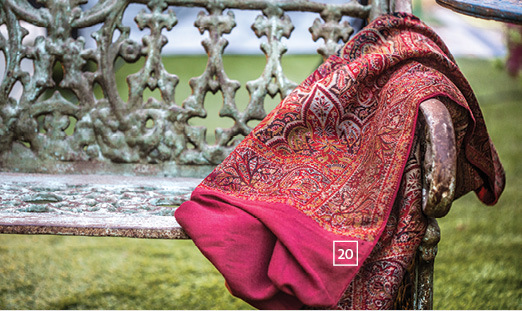 6 The weathered look on the red-hued cast iron vintage bench sourced from Goa is simply charming; ` 72,000. 7 Two marble planters with carved lion faces and a single sheet of glass have been utilized to create this old meets new coffee table. 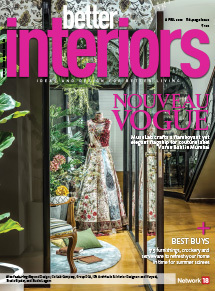 The Big Door can customize such masterpieces to specification with their unique collection of artefacts; ` 21,000 (for each planter). 8 Carved out of a single block of marble, the delicate and durable marble leaf bowls can serve multiple purposes… simply use it as a decoration piece, or a platter during parties, or take a cue from this setting and float flowers and tea light candles in it; ` 13,500 (each). 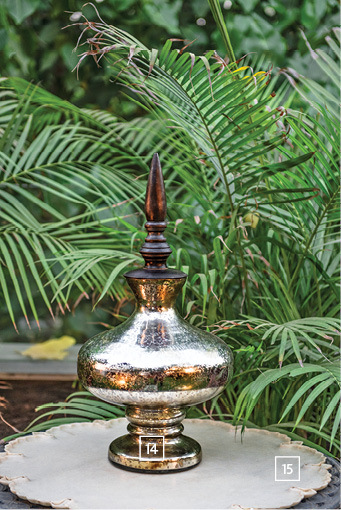 9 This stunning looking piece is actually an old Portuguese candle stand collected from a church in Goa. Crafted in teakwood, this intriguing beauty has faces of angels carved on it. 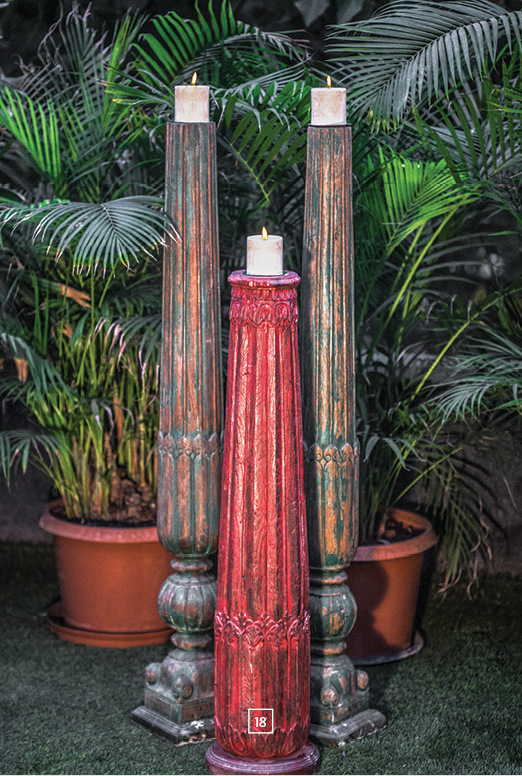 The floral motifs on the candle stand are painted in vegetable dyed colours for added drama; ` 1,05,000. 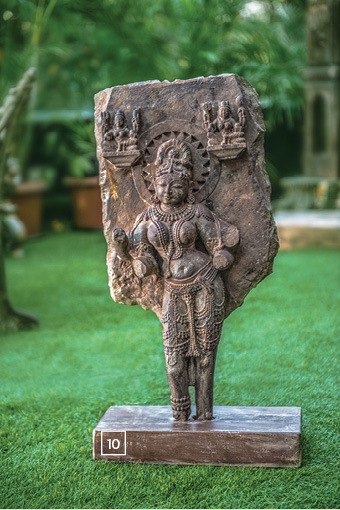 10 The Apsara statue sourced from the south of India is intricately carved to bring out the sharp features and details of the figurine. This sandstone beauty depicts a lady in the dancing form; ` 1,80,000. 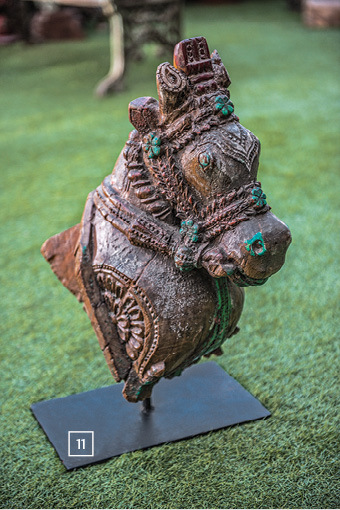 11 This handsome ornamented horse head in teakwood (with a distressed look) has its details highlighted in vegetable dyed colours sourced from south of India; ` 45,000. 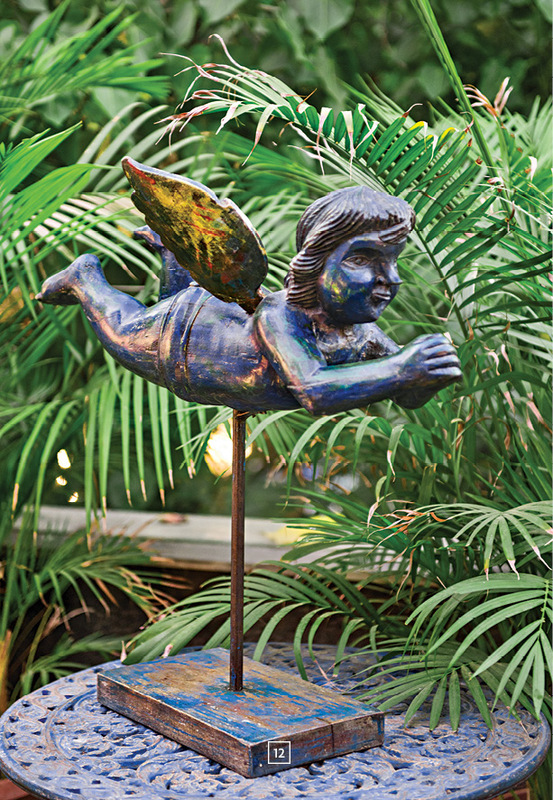 12 Love will forever embrace your home if you buy this Cupid Statue. This delicately carved teakwood artefact is actually Portuguese and is sourced from Goa; ` 31,050. 13 Place this old candle stand in any corner of the house and it would become an instant conversation starter. This teakwood holder was originally a seeder used to sow fields; ` 12,000. 14 Called the Glass Pot; this European style glass jar with vintage finish can enliven any drab corner of your home in a jiffy; ` 12,400. 15 A large, but thin slice of marble from a single slab has gone into the making of this exquisite platter. The craftsmanship and attention to detail on this piece is laudable; ` 18,000. 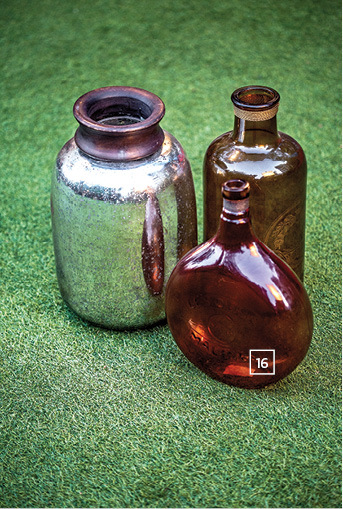 16 These large glass jars (with wood inserts in some) were used to store olive oil and homemade liquor back in the day; today they have turned into stunning decor pieces. Place them together to form an interesting collage or use them as a flower vase to create a pretty picture; ` 5,000 to ` 11,000 (each). 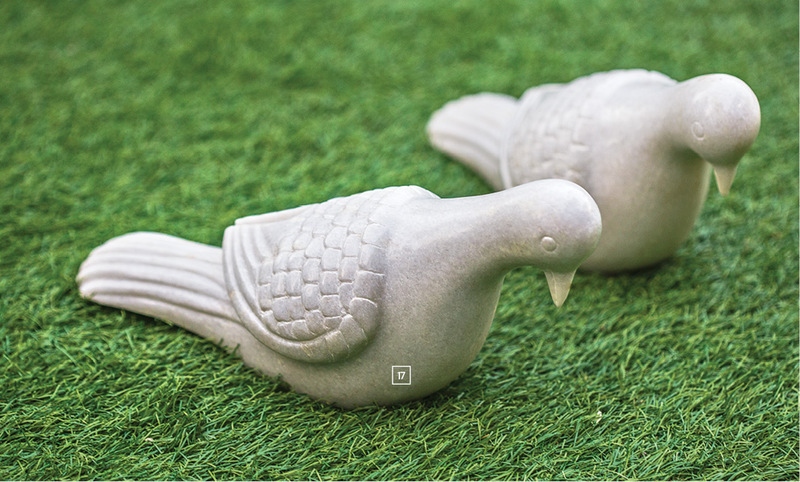 17 Available in a set of three, these adorable pigeon artefact is carved out of a single block of marble. 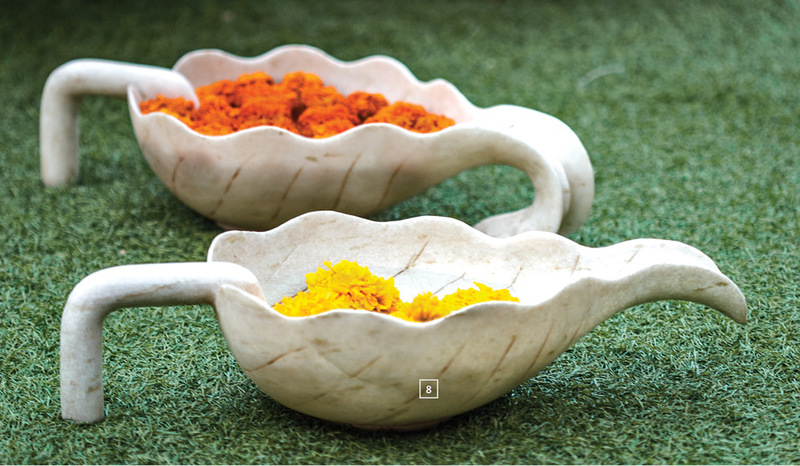 Display it as an accessory to up the style quotient of your garden or lawn; ` 16,500 (each). 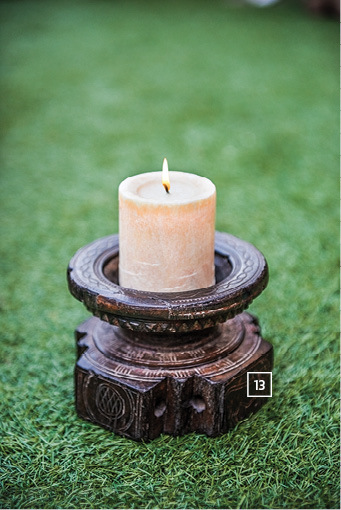 18 An assortment of candle stands with distressed look — these teakwood holders are created from pillars used in old forts of Rajasthan. They are painted with vegetable dyed colours and feature intricate traditional cravings at the bottom; Green: 14,200 (each), Red: 21,750 (each). 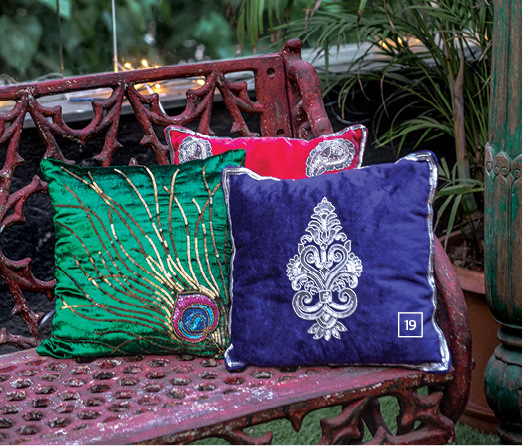 19 Raw silk, velvet and much more… these gorgeous cushion covers are hand embroidered using colourful threads against striking hues to create a product which would befit any kind of interior decor; be it contemporary or traditional; ` 1,500 to ` 3,000 (each). 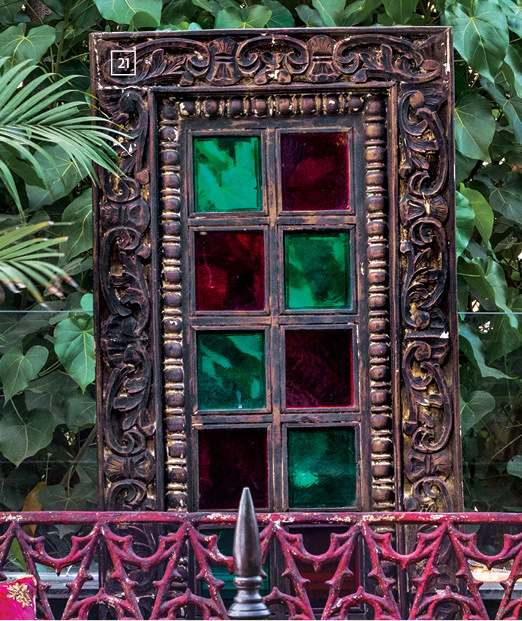 21 This exclusive wooden window panel with traditional carved details on the frame is made using teakwood and coloured glass and can be used as a piece of art or installed as a door or window; ` 31,500. Prices are subject to taxes wherever applicable.